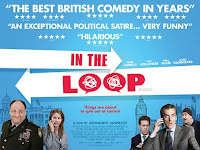 Part West Wing, part Arrested Development, In The Loop is the strangest and funniest political movie since Wag the Dog. The plot centers around a British Minister of International Development, Simon Foster, who can't seem to stop shooting off his mouth to the media about whether or not he believes war in the Middle East is "foreseeable." The U.S. Secretary of State and a high-ranking general (James Gandolfini) are doing everything they can to prevent war and attempt to secure Foster as an ally. Meanwhile the Assistant Secretary of State is hellbent on war and even goes ahead and forms a secret war committee. Foster's incompetent staffer accidentally leaks the existence of the committee to CNN and then all hell breaks loose. While the plot is amusing, what takes front and center in this film is the dialogue. All the characters speak in a fast-paced and witty manner which had me laughing so hard I occasionally had to rewind to hear what I had missed. None of the acting really stands out, but the Best Adapted Screenplay nomination is certainly deserved. Everyone has their favorite lines to quote from the film, but mine occurs after Foster promises his aide something will be "easy peasy lemon squeezy," to which the aide replies, "No it won't. It will be difficult difficult lemon difficult." To prove how fun and witty the screenplay is, IFC Films decided to post it on the internet for all (or presumably at least for Academy voters) to read. While the screenplay makes for a good read on its own, I recommend seeing the film first. This is a hidden gem you won't want to miss.